If your flight gives you time for a layover in Beijing, take the opportunity to get an up-close look at a lasting icon of Chinese imperial power. One of the most unique and iconic sections of the Great Wall is waiting for you on this hike to the ancient fortified pass of Mutianyu. 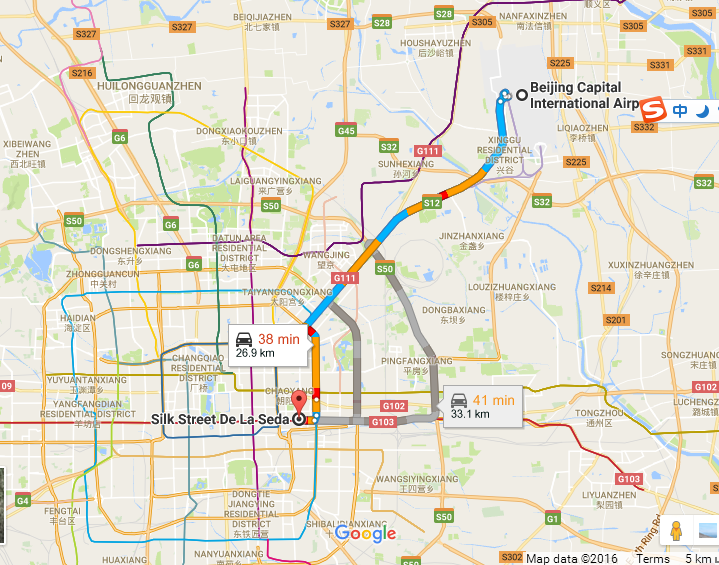 Your personal guide meets you at Beijing's Capital International Airport to begin the drive from the modern city to the forested mountain ridge where this section of the Great Wall stands. Once you arrive at Mutianyu, set out for a hike that takes you along a 3.7-mile (6-km) stretch of stone fortifications and 600-year-old watchtowers that look out over the pass. Despite being one of the best-preserved and scenic sections of the Great Wall, Mutianyu is less crowded than other sections that pass near Beijing. Throughout the hike, you're surrounded by a beautiful landscape of dense woodland and pastures whose vivid colors shift with the seasons. Learn about the history of fortifications on the site that date back to the 6th century. Get plenty of time to admire the grand combination of ancient engineering and natural beauty before your driver returns you to the airport to catch your next flight. 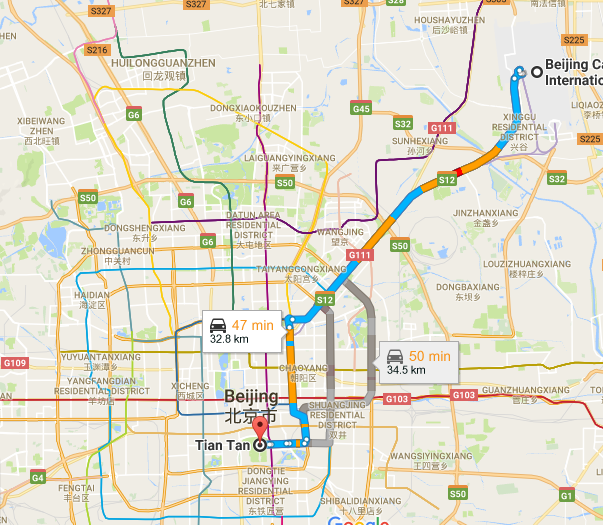 One to two tourists group with a car RMB 600. Three to five tourists group, business van RMB 800. Our driver will lift up your name and meet you after you check out from the customs immigration inspection. Then will driving toward to the Great Wall at Mutianyu. On the way you will view the beautiful countryside and take some photos. YOU ALSO CAN TALE THE TOBOGGAN DOWN FROM THE MOUNTAIN , A LOT OF FUN. 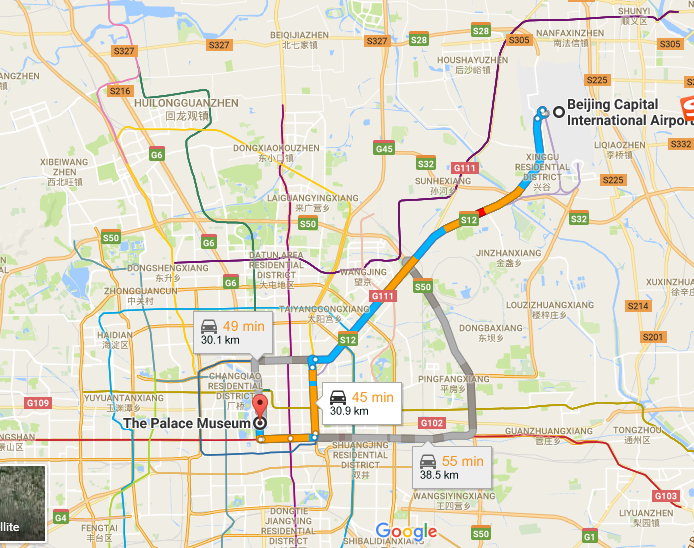 After visited the Great Wall , you can choose a nice Chinese style meal for your lunch it is near by the Great Wall. Drop off you at the airport or your hotel . 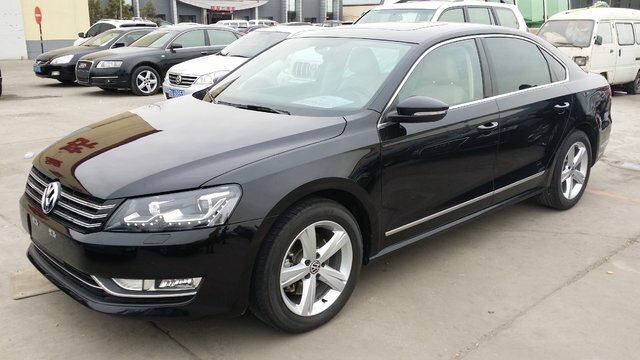 One to three tourists group with a car RMB 880. Four to five tourists group, business van RMB 1000. 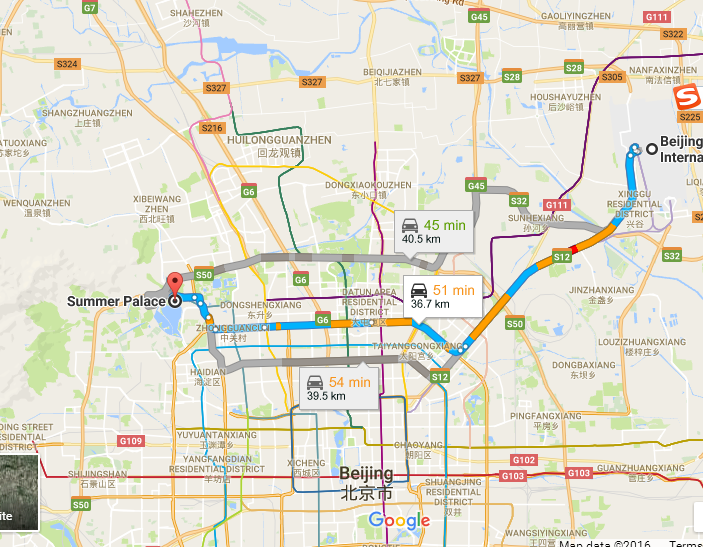 We had a 10 hour layover in Beijing while traveling to Thailand for our honeymoon. Finding Jack on Tripadvisor was a tremendously fortunate discovery. From the initial email correspondence to the airport pick up the communication was clear, honest and prompt. Jack was very informative as a guide throughout our drive to the Great Wall as well as during our 2 hour climb/hike. I had done a little research on the sections of the wall that my wife and I would enjoy seeing. We wanted to avoid crowds and see sections of the wall that may not be completely in tact. Jack understood exactly what we wanted, while also considering the limited amount of time we had. His recommendation was to visit Mutianyu. It was perfect! He treated us like old friends and made sure we were comfortable the entire trip. Given the fact that no public transportation is available to take tourists to the wall, this was certainly a justified travel expense. 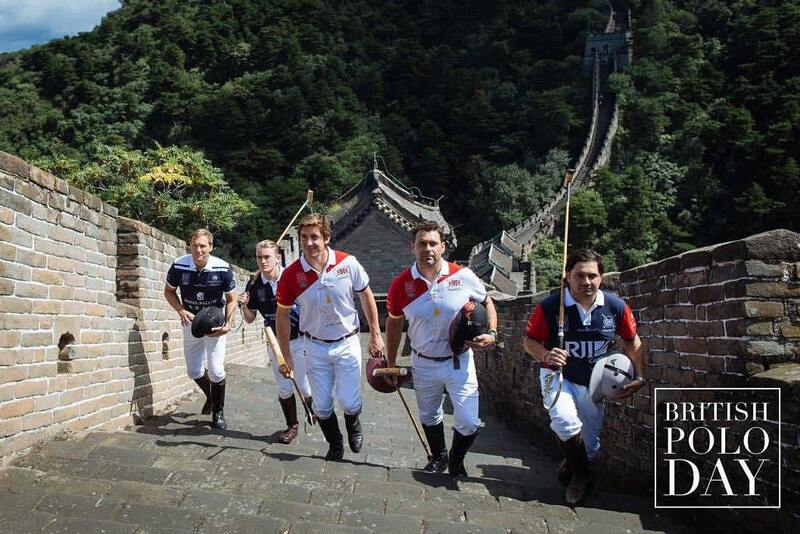 Thanks for Jack made us feel safe, comfortable and welcomed as guests in the extraordinary city of Beijing. 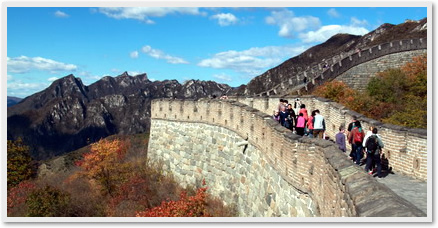 The Mutianyu Great Wall,79 km northeast of Beijing, enjoys a long history and is part of the glorious culture of China. It connects Juyongguan Pass in the west and Gubeikou Great Wall in the east. The wall was first built in Northern Qi Dynasty (550-557). In the Ming Dynasty(1368-1644), under the supervision of General Xu Da, construction of the presently seen Mutianyu Great Wall began on the foundation of the wall of Northern Qi and the Mutianyu Pass was erected in 1404. It served as the northern protective screen, protecting the capital and imperial tombs for generations. The Mutianyu Great Wall is relatively untouched - it is less commercialized, sees fewer tourists and has undergone less restoration work. Standing on top of the wall allows for a panoramic view of the surrounding countryside , which is planted with fruit and chestnut orchards, and dotted with old pine. The Mutianyu Great Wall winds 22 km through lofty mountains and high ridges, many sections of which were made of granite. The unique structure makes the wall almost indestructible. It measures 7 to 8 meters high and 4 to 5 meters wide. Both of the wall's inner and outer sides have parapets to defend against enemies coming from the two sides. Some parapets are saw, tooth shaped instead of the regular rectangular form. Below the parapets, there are square embrasures,the top of which are designed in an arc structure, different from the traditional round embrasures. Both the inner and outer parapets of the Mutianyu Great Wall are crenellated with merlons, a feature quite rare among sections of the Great Wall. 3.Your hotel name with phone number if need drop off . 4.The number size of your group. 5.Any special require. Such as Wheel Chair or Baby seat. 9.We will reply you within 12 hours by returning email. 10. 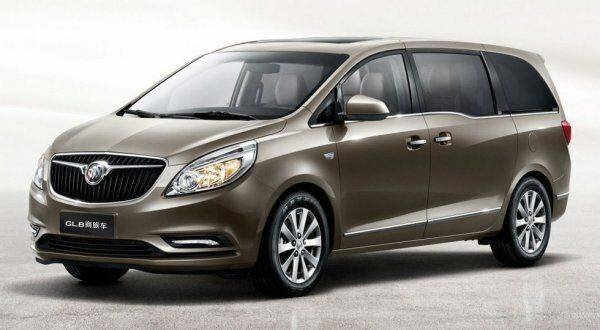 For fast or urgent bookings, you are welcomed to call +86 15011044538 or +86 18601906978(24 hours) to book the trips over the phone. 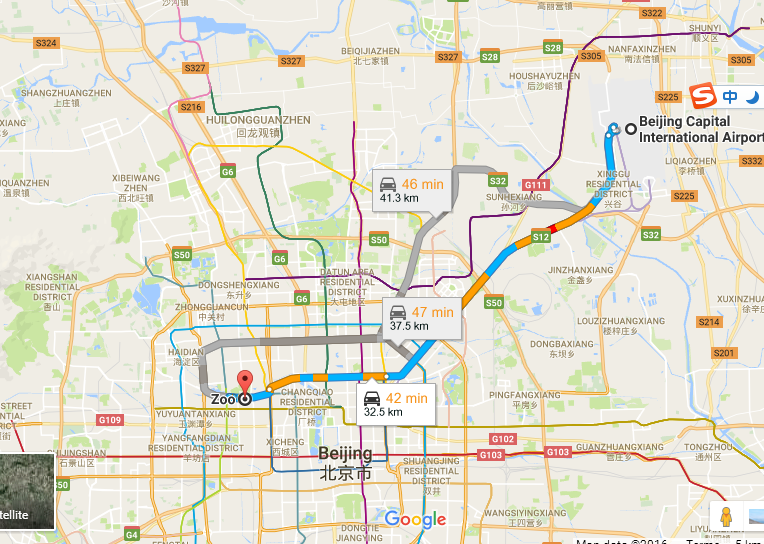 It is about 57 Kilometers , to get to mutianyu great wal, it takes about 1 hour 10 mins. 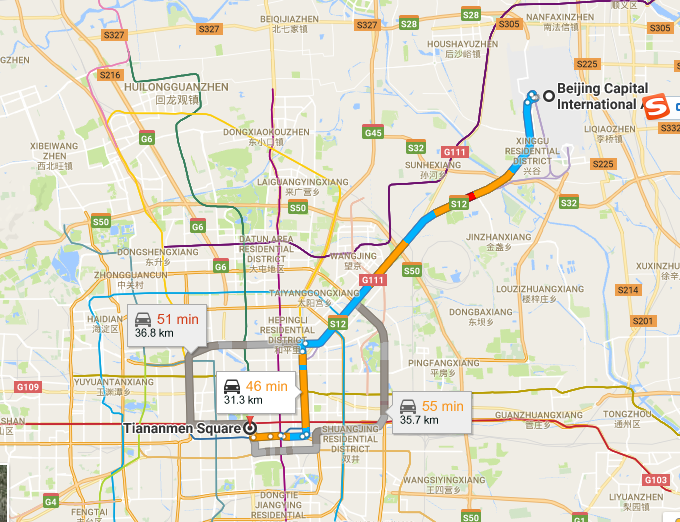 ​How far it is from Beijing Capital International Airport to city center ,Forbidden city?